Link: The lion is per pale Argent and Sable to symbolise the day and night training of pilots. It is gorged with a chaplet of red roses to associate it with Lancashire. A lion per pale Or and vert was the principal charge in the Arms of the ancient monastery of Cartmel near to the location of the station. 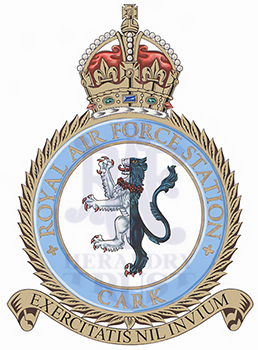 History: RAF Station Cark opened in 1941 and closed on 31 December 1945. Sponsored by Just Wood and dedicated to all who served at RAF Cark.